Confined to the appendix in previous editions of the Diagnostic and Statistical Manual (DSM), binge eating disorder (BED) took a leap into the spotlight with its inclusion as an official diagnosis in 2013’s DSM-5. It is one of the more controversial of DSM-5 disorders, with some claiming that BED inappropriately turns overeating and obesity into a psychiatric disorder. BED’s supporters counter that the diagnosis is reliable and causes real psychological distress. Regardless of which side of the debate you favor, the likelihood of encountering patients who struggle with binge eating is high. In this article, I review how to diagnose BED and introduce strategies for helping kids and teens take back control over their consumption. Patients have recurrent binge eating episodes (ie, episodes of eating significantly more food in a short period of time than most people would eat) occurring an average of once a week for at least three months. Episodes are marked by lack of control over eating and may be characterized by rapid eating, eating while not hungry, or eating alone. Binging is associated with feelings of guilt, embarrassment, or disgust. There is no compensatory purging/weight loss behavior, such as vomiting, laxative use, or obsessive exercise. According to the WHO World Mental Health Surveys (Kessler R et al, Biol Psychiatry 2013;73(9):904–914), BED is the most common specific eating disorder, with a lifetime prevalence of 1.9%. It is roughly twice as common as bulimia nervosa (BN), which in turn is more common than anorexia. BED tends to start a little later in life than other eating disorders, with a median age of onset of 19 years. One striking thing about BED as opposed to other eating disorders is that it occurs relatively frequently in males, with a female to male ratio of about 3:1. As is true for BN, patients with BED are highly likely to have another psychiatric disorder, with an 88% chance of comorbidity in adolescents. The most common comorbid diagnoses are anxiety disorders (especially PTSD and separation anxiety disorder), bipolar disorder, ADHD, and oppositional defiant disorder. Jayden is a 15-year-old boy who has been slightly overweight since he was a toddler. His parents and older brother are also overweight, and they will sometimes make jokes about the family’s weight issues and Jayden’s appearance. Their extended family often gathers for Sunday meals, and Jayden has always enjoyed partaking in the festivities. Over the past six months, Jayden has started returning to the kitchen on Sunday evenings and again on Mondays shortly after dinner and eating portions of leftovers in secret. For the first few bites, he enjoys the food, but then, he says he feels like he cannot stop until the entire pan or container is finished. He is embarrassed by his behavior and feels miserable afterwards. He makes excuses about the missing food, saying the dog ate it or that he dropped it on the floor and had to throw it away. Over the past few weeks, he has also begun purchasing food to eat on other nights alone in his room. He sneaks out before his family wakes up in the morning to bury the evidence in the trash. His parents have noticed that he seems more withdrawn and anxious than usual, and the school called to report he has been refusing to change for gym class. Consistent with Jayden’s case, binging behaviors often go unreported, and they are rarely the primary reason for consultation. Instead, parents may bring in their child for a comorbid condition such as anxiety or depression. Therefore, it’s important to ask specific questions about eating disorders. Also, beware of making assumptions regarding the association between BED and obesity; binging can occur in patients at any weight. 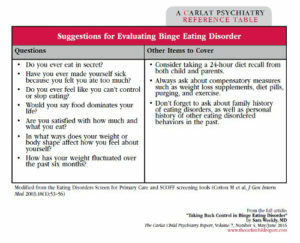 I will also ask specific questions about the patient’s eating habits and relationship to food (see the Suggestions for Evaluating Binge Eating Disorder table on page 3 for a handy list of questions). If your initial screen makes you suspect a binge pattern, the next steps will be to characterize the frequency, intensity, and duration of the binging behavior, as well as the quality of your patient’s thoughts around eating. Most children and teens are frustrated with their inability to control their eating habits. Validate that frustration with empathic and normalizing statements like “a lot of kids have a tough time with controlling their eating, and it’s really frustrating.” It’s important to ask what strategies they may have tried in the past and what that experience was like for them. If patients are reluctant to engage, I’ll often use motivational interviewing techniques to move towards treatment planning. I start by asking open-ended questions about the effects of binge eating: “Do you spend a lot of money on food?” “Does your eating make it stressful or awkward to hang out with friends?” “Does anyone tease you about your eating habits—or do you worry that they might?” “Do you ever fight with your parents about your eating?” “What do you think you might be missing out on because of your binging?” I try to focus on what patients find most concerning or impairing about their thoughts and behaviors. Once we’ve agreed that there are some negative consequences, I’ll explore the patients’ degree of motivation to deal with them. For example, “How much of a problem is it that you’ve been spending an extra $20 a week on your eating?” “How important is it to you to stop?” I take an empathetic, non-confrontational stance with the goal of helping my patients imagine a happier, healthier future self that they feel empowered to work towards. Jayden’s parents brought him to his pediatrician, who referred him to a child psychiatrist for evaluation. He was diagnosed with binge eating disorder, and over the course of the initial interview he agreed that it was a significant problem affecting his relationships and causing him to isolate more and more. He expressed a high motivation to change and willingness to meet with a therapist to learn more. If you are lucky enough to have a local therapist who specializes in eating disorders, that would be ideal. Otherwise, you can refer to a general child therapist or provide the therapy yourself. In some underserved areas, patients may not be able to find specialized treatment. There are various do-it-yourself resources—see the table below for examples of mobile apps and workbooks. With these options, your role is to encourage adherence, set goals, review concepts, and answer questions that come up during your patient’s work at home. CBT currently has the strongest evidence base among psychotherapeutic options for treating BED, although interpersonal therapy (IPT) and dialectical behavioral therapy (DBT) have shown promise in recent studies (Iacovino J, et al, Curr Psychiatry Rep 2012;14(4):432–446). If you do not have specific training in this area but would like to provide treatment yourself, I recommend reading through several therapist treatment manuals and pulling exercises and concepts that fit with your style and patient population (see the Therapist Treatment Manuals for Eating Disorders table). CBT begins with an educational/exploratory phase to help kids understand the factors that lead to binging. Common triggers include the following: 1. Overly rigid “rules” about eating and fasting, rules which patients are likely to break, leading to binges; 2. Chemical disinhibitors (eg, alcohol); 3. Emotional disinhibitors (eg, frustration, academic deadlines, social stress); 4. Situational cues (eg, candy bowls or buffets). Food diaries can help identify where, when, and in what emotional context the binges occur. Once you have this information, work with your patient to create a plan for regular eating, including a balanced meal or snack every 3–5 hours. Develop a list of strategies that the child can use to avert binge impulses. These might include activities that are incompatible with eating (eg, finger painting, going for a walk, playing an instrument), self-talk and affirmations that reinforce the patient’s sense of control (eg, “This craving is temporary,” “I can choose to leave the kitchen,” etc), and preventing situational triggers (eg, ordering a la carte at buffet restaurants, starting school projects earlier to avoid stressful all-nighters). In addition to these therapeutic strategies, consider adding exposure exercises with “forbidden foods” to help take the power out of these items. For kids who identify bullying or family conflict as triggers, you can also work on communication skills and assertiveness. The last phase of treatment will focus on relapse prevention. Patients with BED often struggle with all-or-nothing thinking, and it can be helpful to anticipate and normalize setbacks as a natural part of the recovery process. This free sample feature article ends here. To read the full article, please subscribe to The Carlat Child Psychiatry Report here. Dr. Weekly has disclosed that she has no relevant financial or other interests in any commercial companies pertaining to this educational activity.